As the title suggests I had a pretty musical weekend. It kicked off really nicely with a Nick Cave and Grinderman gig at the lovely Thebarton Theatre in Adelaide. Before I extol the wonderfulness of Nick Cave I have to say that Thebarton Theatre is one of the best venues in Adelaide to see bands. It’s got personality and soul. It opened in 1928 and I sure hope it’s around in 2028 so I can potter along and see bands there. I might need to sit down rather than stand up at the front by then. Back to Nick Cave and Grinderman. I thoroughly enjoyed the Grinderman set. I haven’t listened to lots of their music but it took me back to the days when I first started going to see bands 20 years ago in pubs. I was one of the only people who didn’t take any photos there but Daniel Boud took some great photos at the Sydney gig but not of Grinderman unfortunately. The band members all had longish hair and long beards and looked quite ZZ Top. The song ‘Words of Wisdom’ made me think that Nick Cave would be very comfortable being one of those tv preachers getting people to sell their souls. Then Nick Cave came on doing his songs and did many favourites. He ended with a bit of whimper though, not a bang like I would have liked. A couple of times they stuffed up and I even heard Nick say at one stage that his voice was totally fucked, something I could relate to two days later. So on to the rest of the musical weekend. 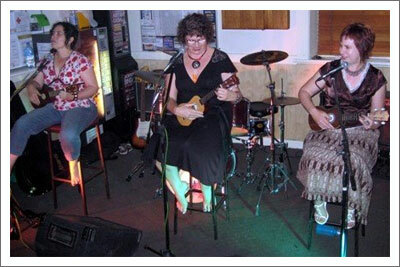 Myself, my two singing/ukulele playing mates and three other good friends/supporters all went over to Yorke Peninsula on Saturday so we could play at a local Jam on the Sunday. On Saturday my voice started going downhill and on Sunday it was very croaky. I gargled salt water, I drank cups of tea, I tried not to talk, I warmed up my voice so I wouldn’t strain it while singing. I did just about everything I could think of to conserve my voice and was really really worried that it would sound crap during our three song set. It didn’t sound its best, but it was passable. Here we are – I’m on the right. We were all really nervous but our three songs went down really well. My feet on this stool were madly shaking and so were my hands which is really unfortunate when you’re trying to play the ukulele so some of the plucking and some of the chords were quite suspect but they weren’t miked up which was quite fortunate. There’s some more photos of our weekend. Hey Jen….don’t you look great! Loved the photos….looks like such a good time. Is there a chance to be able to hear any of your songs? I’d love it.